Secretary-General Ban Ki-moon meets with Virginia Gamba (centre right), Head of the OPCW-UN Joint Investigative Mechanism, tasked with identifying “individuals, entities, groups, or governments involved in the use of chemicals as weapons” in Syria. The Syrian Airforce and ISIL used toxic chemicals as weapons, according to a new report issued on Tuesday by Organisation for Prohibition of Chemical Weapons and United Nations Joint Investigative Mechanism (JIM), and mandated by the UN Security Council. The Mechanism, led by a three-person Leadership Panel (Virginia Gamba, Adrian Neritani, Eberhard Schanze), examined nine cases of previously-documented chemical weapons use to establish who was responsible for using them. The Panel found what it described as “sufficient evidence” of three cases of chemical weapons use – two chlorine gas attacks on civilians by the Syrian air force, and another use of “sulphur-mustard” gas by the terrorist group ISIL, or Daesh – in Syria between 2014 and 2015. The Mechanism was mandated by Security Council resolution 2235 (2015) to identify, to the greatest extent feasible, those involved in the use of toxic chemicals as weapons in the Syrian Arab Republic. Earlier, a Fact Finding Mission (FFM) mandated by the Organisation for Prohibition of Chemical Weapons (OPCW) had determined that a specific incident in the Syrian conflict involved or likely involved the use of toxic chemicals as weapons. After reviewing all the information gathered, the Mechanism found no evidence that armed opposition groups had been operating helicopters at the time and location of the cases investigated. The report comes as the UN General Assembly prepares to mark, on Wednesday, 31 August, the International Day against Nuclear Tests, dedicated to coalescing global efforts towards achieving a world free of another form of weapons of mass destruction, namely: nuclear weapons. The UN News Centre asked the Head of the Mechanism, Virginia Gamba, to outline the scope of their investigation. Virginia Gamba: Well, we have been task-mandated by the Council, to identify perpetrators on the use of toxic chemicals in Syria, over the last two years. And we spent some time looking at this – we had nine cases that we mentioned we would want to go forward with – and now we have finally concluded on the nine cases. So the report talks about three cases that the Leadership Panel has found sufficiency to prove who the responsible members are. In the three cases, the responsible ones were identified as Syrian Airforce (in two of them), with chlorine gas, and in one of them, ISIS, with the use of sulphur mustard. There were other three; I will tell you their names: the first one was Talmenes- and that happened in 2014 on the 21st of April. The second one was the 16th of March 2015 in Sarmin- and these two were attributed to the Syrian Airforce; and the third one was on the 21st of August 2015, in the city of Marea- attributable to ISIS. UN News Centre: You are saying then, that there were three conclusive cases and six that were not? Virginia Gamba: Well, in three cases, the Leadership Panel determined that there was closely sufficient information to reach a conclusion, but those cases remain open, because we are waiting for some analysis – there’s a fourth [one] coming from the forensic institute laboratories, and we need this to be able to reach a conclusion on those – but the Panel will provide an update on these three cases in the fourth report which is due in mid-September. These three cases cover Kafr Zita (18 April 2014); Qmenas (16 March 2015); and Binnish (24 March 2015). There were a last set of three, and these ones the Leadership Panel has determined that they are inconclusive – we cannot get sufficient information, or that there is information that is too contradictory for us to be able to continue with this – so there will be no further investigation in these three cases, that is: Kafr Zita (11 April 2014); in Al-Tamanah (29 to 30 April, 2014); and in Al-Tamanah again (25 to 26 May, 2014). UN News Centre: How were the investigations conducted? Virginia Gamba: Well, we had an unprecedented mandate. No one had ever done this before in the United Nations, so we really didn’t have standard operating procedures to engage; we had to develop our own parameters of investigation. And what we did is, the investigators used the fact finding mission’s findings in The Hague from the OPCW, who had originally investigated what was the substance used in these cases, and so we did a whole study of what they had there, and then we began to independently collect and analyse, and corroborate the information and further information, within the allotted time-frame – as you know we have a time-frame when we finish on the 23rd of September this year – and it was really necessary for us to do the investigation in depth, and it had to be done in an independent, impartial, objective and very professional manner, because we were very much being looked by everybody, and how we engage in these issues is of high relevance to many actors. So, we then sought expert support from forensic and technical, and research institutes, and they played a very big role in the corroboration of the information we were collecting, so it could be independently verified through them. So it was a professional, I would say, fit-for-purpose manner that we chose as our procedures. It was really absolutely essential to make sure that there was a sufficient degree of relevant and credible information and evidence at the end, if not, it would have been very hard for the leadership panel to reach conclusions. UN News Centre: You did not actually send people on the ground to collect samples, but these were based on information that had already been collected at the time of the incidents? Virginia Gamba: Yes, what happens is this mandate – the mandate we have – is not about verifying the use of a substance, because that really belongs – if you are a state party of the Chemical Weapons Convention – it belongs to the OPCW. So the Organisation for the Prohibition of Chemical Weapons instituted what is called the fact-finding mission of their own inspectors. They did not have a mandate to attribute who had done it. They were only asked to say what had been used in that allegation. When we came in, our mandate says: from the moment that they conclude and verify that a substance was used, then we need to try to find out who had used it. To be able to verify who had used it, you would need a different set of, if you wish, tools. In a way you don’t need to engage in sampling of the environment or again blood sampling, or looking so much into the effects on people to determine the substance. What you need to do is: how was the substance used? What was the ammunition utilised? What was the delivery system utilised? What was the motive behind such an attack, and these presumably will lead you, little by little, towards the conclusion about who was responsible, and that is exactly what we did. So neither, may I say, neither the FFM [Fact Finding Mission] nor ourselves, were able to go to the sites. Because the sites are under intense attack, and have been under intense attack between 2014 and 2015, so security was impossible. But we did send many deployments, both to Damascus and the neighbouring countries, and we had a lot of witness interviews that we did, both in the field, in the region, as well as through electronic forms. UN News Centre: So then, finally, what are the conclusions of the investigation, and the report’s recommendations? Virginia Gamba: All we have to do is to identify – and in that sense we have identified those perpetrators; basically two actors: one, the Syrian Armed Forces – particularly the Airforce – and the other one, ISIS- in the case of Marea, which was one of the three cases that proved positive, on positive identification. This information is now with the Security Council, and it is up to them to follow up on accountability process- what they are going to do with this, is something that they must now engage in. UN News Centre: How disappointed were you with the result of this investigation? Virginia Gamba: I think I am not disappointed at all. I think, for me, what is important is that it can be done. It can be done. Remember, no one had ever attempted to do something like this. It is almost like doing archaeology, and in a very visible environment as the United Nations is, with very few tools to engage; the fact that we were able, in such a short time-span, to reach conclusions that were positive in at least a third of our cases, I think is quite extraordinary. The Leadership Panel, when we were looking at this, noted with great concern that toxic chemicals have been used, and continue to be used in the Syrian Arab Republic – even through the length of the time that we were engaged, we could see in the papers that it continued to happen – and we really strongly believe that this must stop. We did notice – because we have to; we look around, we were asking questions – and we found that there is a diversification of both the type of chemicals used today and the actors involved seem to be multiplying. So, we just want to say it very clearly, that all those responsible for the use of toxic chemicals as weapons in Syria must be held accountable in order to deter such actions in the future. 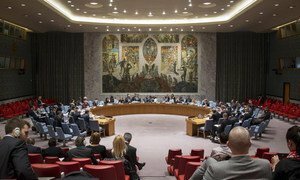 And it is the Leadership Panel’s hope that the results of the mechanism’s investigation will really contribute to this process through the Security Council. UN News Centre: To be clear you are saying that the use of chemical weapons not only continues in Syria, but that the number of parties making use of chemical weapons is multiplying? Virginia Gamba: There are more actors today in Syria with the availability of the substances and the ability to mix them and use them, if they so choose, as chemical weapons; and this is something very worrying.